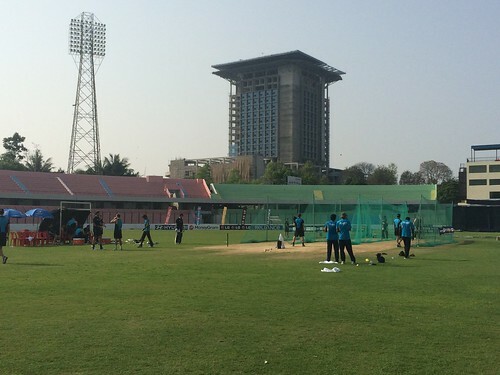 So on my second trip away with the BLACKCAPS I went back to Bangladesh for the ICC World T20. Here’s what happened – you can click the photos to make them bigger. From the moment you got off the plane and saw the WT20 signs throughout the airport, the streets lit up with millions of fairy lights and the masses of police and helpers buzzing around the hotel you felt you were in cricket central right at the moment. It was very exciting to be in the same place as all the teams, the ICC crew and the world’s media with a big event to get stuck into. The TV was wall to wall coverage of every warm up match with endless punditry. Even the ads were overwhelmingly cricket-related (friends, I wish I could have brought you all back a T20 biscuit). A cut-down version of this song played at least three times in each commercial break. 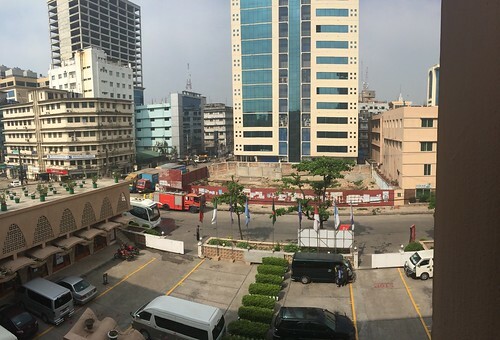 The view from the hotel in Dhaka. 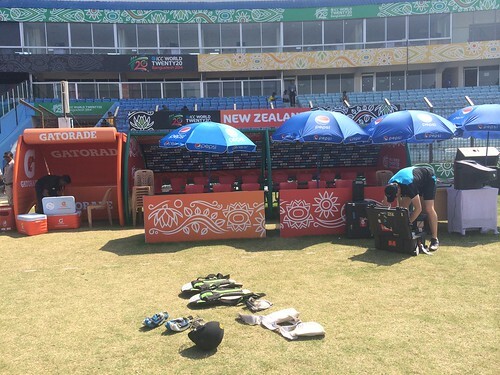 The BLACKCAPS shared with Pakistan, India, South Africa and England during the warm-up week, and with England at the Chittagong hotel. My ‘play it cool’ ability was severely tested when, say, JP Duminy got in the lift or I found myself next to Kapil Dev in the omelette bar queue. Dhaka traffic was at a hot, impatient stand still for much of the time we were there, so it was a relief to get down to Chittagong for the pool games (a city of just the 6.5 million people). The BLACKCAPS played a warmup against Pakistan at Mirpur, the venue for the final, and one against Australia (who out-gunned me completely with three media / video / social people) here at Fatullah on the outskirts of Dhaka. This one wasn’t televised back home (much to the internet’s annoyance). The view from the hotel at Chittagong. Again, the team is pretty much in lockdown when staying here, with no scope to sight-see or even go for a wander down the street. Apart from venturing onto the field and dugout at games or training, you basically sit in air conditioning for a couple of weeks. It was a bit of a challenge to keep occupied to say the least, with films and TV series being copied from hard drive to hard drive at a rate of knots. Personally I got through a fair amount of Sopranos re-watching, and got into Deadwood, if you’re remotely interested (!). The tennis-racquet-mosquito-zapper got a fair work-out. Spidercam was everywhere, as was DK Morrison. The two days the team spent training at MA Aziz stadium, which is a compact concrete affair, before the Netherlands match were the hottest I’d experienced on this trip or back in October. Fannying about with a video camera and, um, just standing there had me sweating buckets, so the chaps doing serious time batting and bowling in the nets were doing it tough. 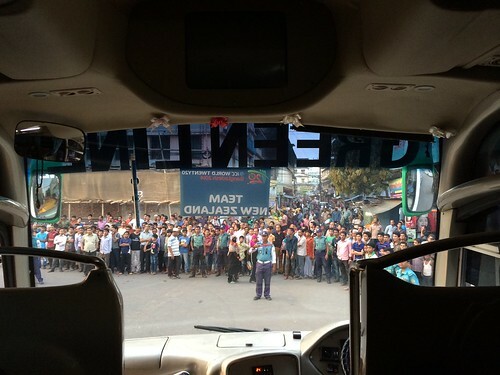 Drawing a crowd pulling out from Chittagong’s Hotel Agrabad. 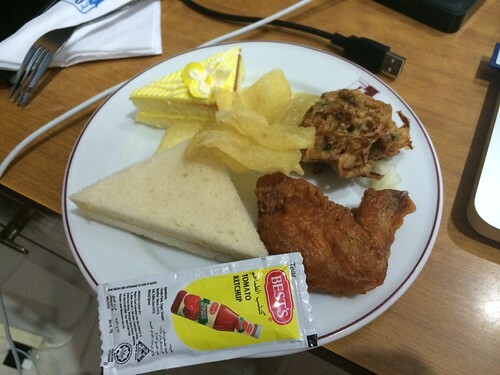 If you happened to be in your room mid-afternoon in Chittagong, you were offered complimentary snacks, and what fine snacks they were too. Food plays a big part in life on tour – you’re always watching what you have for fear of getting sick. Breakfasts are a long, leisurely affair – with so much time to kill, it’s a good way to catch up with everyone and yarn – everyone’s on their phones discussing news from home or bantering about sport (Ford Trophy, MLB and English football all feature). The team made several visits to Ambrosia, the wonderful restaurant with a menu thicker than most phone books. 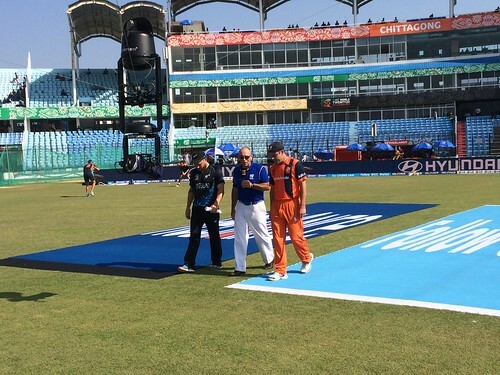 Being a big wuss, it was quietly moving to stand with the coaches and support staff during the national anthems. As any NZer who’s seen the All Blacks at Twickenham or the BLACKCAPS at the Oval knows, there’s nothing like supporting your team overseas and being a small part of the team somewhere so far removed from home was a thrill for me. Of course, no-one was happy when the team came home early – this reaction from the skipper pretty much sums it up. While everyone hoped the South Africa match would not come back to haunt the team, in the end, it kind of did. Of course it was nice to come home early and see the family and eat NZ food again, I’d really wanted to go back to Dhaka for the semi finals and even a final as we all did, but it wasn’t to be. If you’re able, spare a thought for the team and support staff who then embarked on an almost 50 hour journey home, through Dhaka – Dubai – Bangkok – Australia – NZ. While I hadn’t expected to find myself back in Bangers quite so soon after the last time there, and despite the early tournament exit, I thoroughly enjoyed my time with the BLACKCAPS team and support staff and the challenge of the job over there. Living in cricket central was magic, if only for a couple of weeks. If you’re up for more, read my tour reports at blackcaps.co.nz – part one and part two. 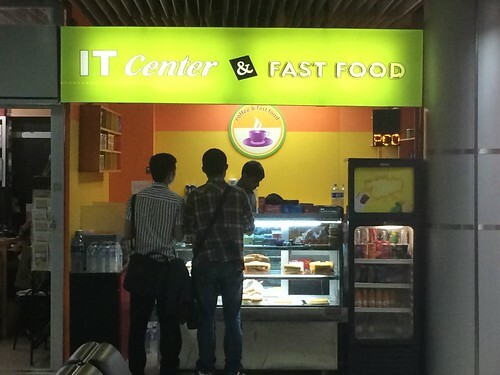 IT Center and Fast Food in Dhaka Airport is my kind of place.